How can I manage my posting schedule? 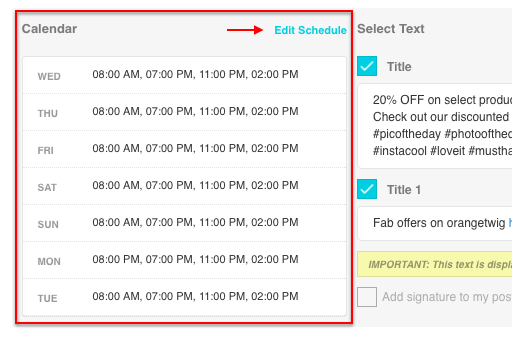 Steps to send out social media posts on specific days. 1. Go to the Marketing tab in your Socioh dashboard. 2. Choose the campaign type - Product Sale / Daily Deal / Coupon Code / Auto-Pilot. 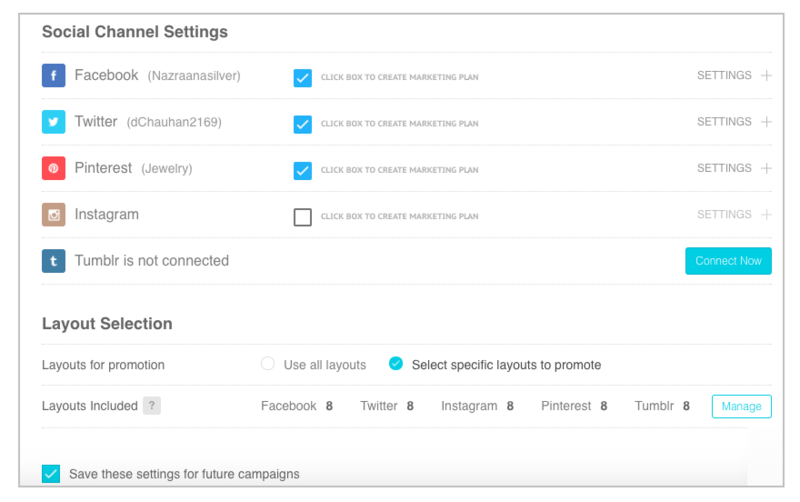 Once you've scheduled your campaign, you'll come to the Marketing Plan settings. In case of Coupons / Auto-Pilot, you'll come here after entering details (products, layouts and duration) of your campaign. 3. Click on Settings for the relevant channel. Click on Edit Schedule under Calendar in the left section. 4. On each day, you have the option to add post time and to remove the time. To add a post time, click on Add Posting Time and to remove a time, click on X (cross) next to the time. If you don't want your posts to go out on a particular day, remove all the time options. Click Done once you're through making the edits. Note: Don't forget to Create the Marketing Plan and Schedule your plan once you're through making the edits.